Designed to be eco-friendly and more durable than traditional wood, engineered wood products are made of recycled wood mixed with resin. Engineered wood is more resistant to decay, rot and insects and has an increased lifespan than regular wood. This type of building material was born for the construction world of the 21st century where eco-friendly, and durability values are held in high regard. If you are building a new house or renovating your old one, you should definitely consider engineered wood for the siding because it has many advantages. Engineered wood is pre-painted and pre-finished, so the only thing that remains is its installation. Being lighter than other siding materials, it will save you a lot of the transportation cost, and it is easier to handle. If you want to avoid having your beautiful siding destroyed by termites or decay, then you should use this type of wood because it was created to be very durable. It also looks very nice because it maintains that rustic yet elegant charm of traditional wood, offering you a vast range of choices. And last, but not least, engineered wood is cost effective and eco-friendly, making it a great choice for your house. At Gut-R-Dun, we work only with premium suppliers to ensure the high-quality of the work we do for you. When it comes to engineered wood siding options, our supplier is CanExel, a premium company that innovates constantly to bring you the quality you deserve. 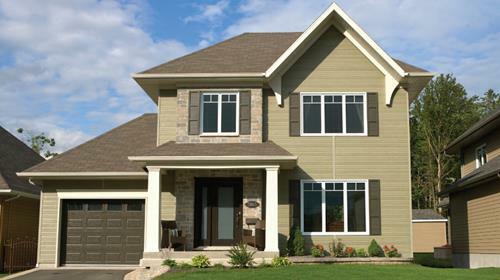 You can choose from three types of engineered wood that we will use for the siding of your house. Ridgewood D-5 has an authentic look and comes in 21 colours you can choose from. It has a warm appeal, and it is an elegant choice for your house. Ced’R-Vue also comes in 21 beautiful colours and has a traditional and very elegant look, while Ultra Plank is a versatile choice and can be installed vertically or diagonally. All the products from CanExel have a 25 years warranty against separating, peeling and chipping. Tell us which one of those noble engineered wood products you want us to use for the siding of your home and we will create a masterpiece out of your beautiful house.